16-year-old Imogene's mother explained the move by saying that it would allow the family to "find themselves". As Imogene* puts it, "Find herself, she really meant. Neither my brother Jared nor I was particularly lost." Although she didn't consider herself lost, she was aware that some of her past choices maybe hadn't been the best. So with the move to Newford, she decides to try to change. To avoid running with a rough crowd, to stop skipping so much school, to bring her grades up. To stay out of trouble. "No, I mean, funny-strange," I said. "He's gone. But where could he have gone? He was right by the end of that line, and it's too far to the door for him to have slipped out. I only looked away for a second." Maxine got an odd look. "You must have seen Ghost." This was good, I thought. A nickname was a start. "How'd he get the name?" I asked, though I could guess from the way he kept disappearing on me. "Because he really is a ghost. People have been seeing him for years." I waited for a punch line, but it didn't come. "Why would I joke about something like that?" "If you don't believe me," she said, "ask somebody else. Though I should warn you, popular wisdom has it that only losers ever see him." Imogene was ready for the trials of being a new kid in school (avoiding the mean-and-popular crowd, trying to win over her new best friend's mother, getting to know a new city), but she hadn't expected them to be compounded by a haunted high school, some rogue fairies, a long-forgotten imaginary friend, and a creeping darkness. I do love stories set in and around Newford. I love meeting up with the same characters again and again -- Christy Riddell, who is a major character in Spirits in the Wires, has a cameo in this one, and when Maxine mentions loving Jilly Coppercorn's artwork, I thought, "Oh, I know her..." It's a nice, comfortable feeling. It makes me feel like I'm part of the story. And after reading a few of the novels, the city itself is starting to feel like an old friend. I feel odd even comparing the two, but on a very basic level, The Blue Girl has the same setup as Jinx -- they are both new kid in school stories with a supernatural twist. But The Blue Girl is so far superior that it is almost painful to use them in the same sentence. 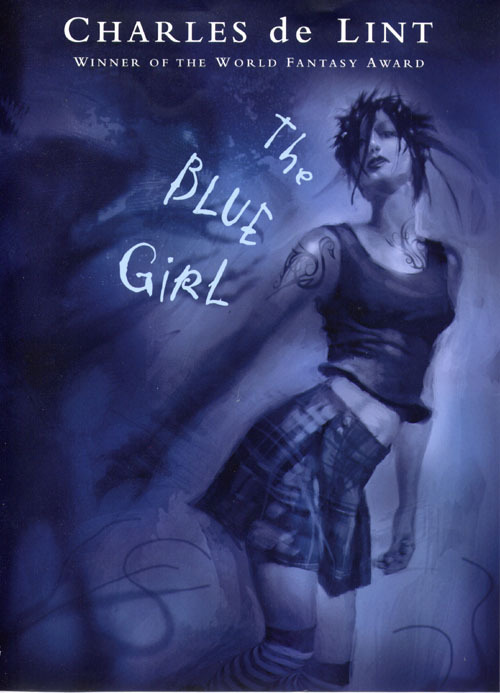 Reading The Blue Girl, I cared about the characters, I had questions about their world, I thought about things, I wondered how everything would turn out. The characters had their own, distinct voices. Reading Jinx, I just turned the pages and waited for the inevitable bad-girl-gets-hauled-out-in-a-straitjacket**-and-good-girl-kisses-the-boy scene. I believed in Imogene and Maxine and Adrian, and even in Maxine's mother, while Jinx & Co. stood around like paperdolls, waiting for Meg Cabot to nudge them around the room. Oh dear. I didn't mean to turn this into a blabberfest about a different book that I didn't like. Clearly I had some strong feelings that needed to be expressed. And none of this is to say that The Blue Girl is a perfect book -- the BMOC Alpha Male Football Bully was a stereotypical character if ever I saw one, and he seemed to be there for plotting purposes more than anything else -- but it's a good one, and I found it hugely enjoyable. *She mentions at one point that she was named for the title character in this fantastic book. **Which actually didn't happen, but she got sent away to some scary military school, so whatever. Same diff. The many names of M. E. Kerr. I just saw Doris Lessing's reaction to winning the Nobel Prize.